Officials from the Office of the U.S. Trade Representative (USTR) have held separate meetings this month with counterparts from both Chile and Argentina. Officials from the United States and Argentina held the second meeting of the U.S.-Argentina Council on Trade and Investment under the Trade and Investment Framework Agreement (TIFA) signed in 2016. Deputy U.S. Trade Representative C.J. Mahoney chaired the council’s October 19 meeting for the United States. Co-chairs for Argentina were Ministry of Foreign Affairs Secretary for International Economic Relations Horacio Reyser and Ministry of Production Under Secretary for Foreign Trade Shunko Rojas. USTR’s chief agricultural negotiator, Ambassador Gregg Doud, and Argentina’s Ambassador to the United States Fernando Oris de Roa also participated in the meeting. U.S.-Argentina discussions covered a wide range of bilateral trade and investment issues, including the nations’ respective ongoing international trade negotiations and initiatives, bilateral agricultural market access issues, and ongoing work in the Global Forum on Steel Excess Capacity. The officials also discussed cooperation on bilateral and multilateral trade initiatives, such as fisheries subsidies, industrial subsidies and state-owned enterprises, and agricultural issues of mutual interest. Officials took stock of the discussions in the Forum on Innovation and Creativity for Economic Development, including the talks on fostering cooperation on innovation, the patent backlog, enforcement actions against pirated and counterfeit goods, and pending legislation. Officials agreed to hold the next forum meeting in early 2019. The United States and Argentina look forward to continuing a constructive and open engagement under the TIFA with the goal of strengthening bilateral and economic ties to the benefit of both countries. The two countries also agreed to work together toward a commercially meaningful outcome in the ongoing World Trade Organization initiative on electronic commerce. Two-way trade in goods and services between the United States and Argentina totaled $26.3 billion in 2017. Two-way trade in goods totaled $14.3 billion and two-way trade in services totaled an estimated $12 billion in 2017. Earlier in October, Deputy U.S. Trade Representative Mahoney and Chile’s Director General for International Economic Affairs Rodrigo Yáñez Benítez reviewed the impact of the U.S.-Chile FTA since the last commission meeting in December 2016. Both parties emphasized the importance of ensuring the effective implementation of the agreement, which has been in force since January 1, 2004. Officials from both countries recognized the value of their dialogue regarding the implementation of Chapter 17 (Intellectual Property Rights). Chilean officials explained the status of ongoing domestic work regarding intellectual property matters, including the passage of legislation targeting certain aspects of satellite piracy. Both the United States and Chile underscored the value of strengthening and improving cooperation on intellectual property between the two countries. Officials also discussed a number of other bilateral matters of interest, including pharmaceutical patent-related issues, nutritional labeling, and the status of product-specific rules of origin change requests. In accordance with Article 21.1.3 (b) of the FTA, the commission signed a decision agreeing to modify Annex 4.1 (Specific Rules of Origin) of the FTA to maintain consistency with 2017 updates to the nomenclature for the Harmonized Tariff Code System. The United States and Chile held meetings of the Committee on Sanitary and Phytosanitary Matters on Thursday, October 11, and the Committee on Technical Barriers to Trade on Monday, October 15. The commission also reviewed outcomes of the eighth meeting of the Environmental Affairs Council under the FTA and the sixth meeting of the Joint Commission for Environmental Cooperation under the U.S.-Chile Environmental Cooperation Agreement, which took place in Santiago, Chile on September 4–5, 2018. As the United States and Chile approach the 15th anniversary of the U.S.-Chile FTA, the United States looks forward to continuing its engagement with Chile to fully implement the FTA to the benefit of both countries. For the United States, total two-way goods trade with Chile totaled $24.2 billion in 2017 and total two-way services trade totaled $6 billion in 2016. In 2017, Chile was the United States’ fifth largest goods trading partner in the Western Hemisphere and 29th largest overall goods trading partner. The United States maintained a trade surplus with Chile in both goods and services totaling $3.1 billion in 2017 and $2.6 billion in 2016 respectively. 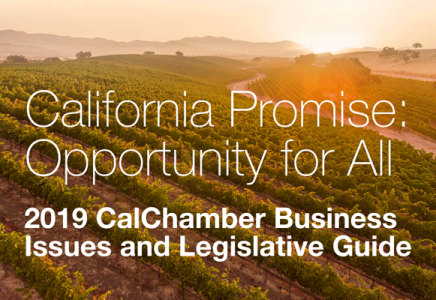 The California Chamber of Commerce has been a longtime supporter of the U.S. – Chile FTA, and has represented on the Chile-California Council https://chile-california.org/ since its establishment in 2011. The Council works in the realm of relational public diplomacy. The Council unites advocates from Chile and California in both the public and private realms to support bi-lateral cooperation among individuals, groups, organizations, corporations, world class universities, and governmental agencies to promote scientific research, entrepreneurship, social innovation and public leadership.